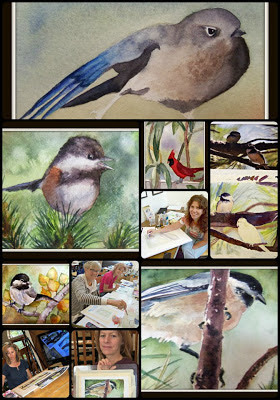 I recently finished giving a workshop on painting birds in watercolor. One of my students did a compilation of photos from the students art and my painting. She graciously said I could place it on my blog. I think everyone had a good time and learned a lot. 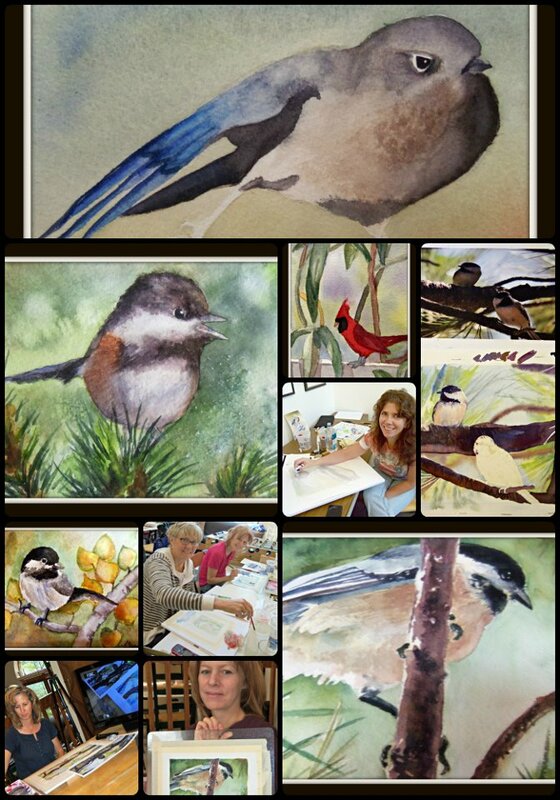 I am in the lower left demonstrating and part of my bird watercolor is on the right side with two black-capped chickadees showing. In the workshop, we worked on ways to depict the birds feathers whether they were soft and fuzzy or the stiff flight feathers. I also demonstrated how to paint the birds eyes to give them life. Most of the backgrounds were soft focus because of the close-up look at the birds. My painting was of 3 black-capped chickadees that I placed together from different photographs. I used a soft focus background and glowing light behind the birds. See Below. This painting will be framed and matted and for sale during my featured month at Arati Artists Gallery, Colorado Springs, during the month of November. From the results of your students, you're a great teacher. They all did nice work, and I love your piece with that back-lit, soft-focus background. Great composition too! Thanks for sharing. Un très joli patchwork de photos... mettant en scène de très bons moments. What a fun workshop, and beautiful painting!